History - Ravensara was used in remedies to treat shingles, viral infections, flu and bronchitis. A decoction from the bark was used to tighten and firm the skin while toning the muscles. 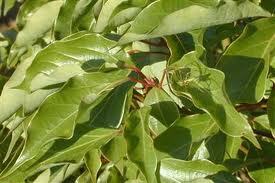 Because of its similar scent to eucalyptus, it was used to clear breathing passages. Effects on the Mind - Ravensara is a stimulating oil that awakens the mind and aids in concentration and may help with memory loss. When used with oils such as cedarwood, myrtle and frankincense it is soothing and relaxing which may help those with insomnia. Effects on the Body - Ravensara is one of the most powerful anti infectious - anti viral essential oils on the market. It is one of the best oil to use when you have the flu! May be used internally or in room sprays to disinfect areas which have been contaminated with virus. Blends Well With - Ravensara blends well with most herbs, like Thyme, Marjoram, Rosemary, Lavender, Cedarwood, Lemon, Myrtle, and Frankincense.